We were lucky enough to have a Sunday rainout this weekend, and got to spend time at our “Aunt Amy’s” house in Massachusetts. It’s pretty wonderful to see how our little baseball family has extended over the past two years, and it was a pleasure to spend some unexpected free time hanging out with friends. We had a great cookout despite the weather and made a Greek inspired feast. 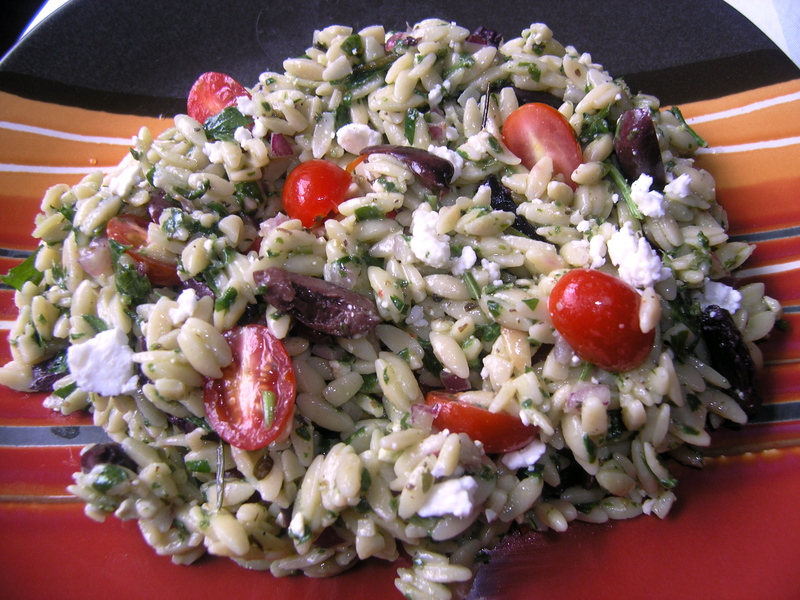 This orzo salad is a great accompaniment for lamb, chicken, or even a picnic lunch. 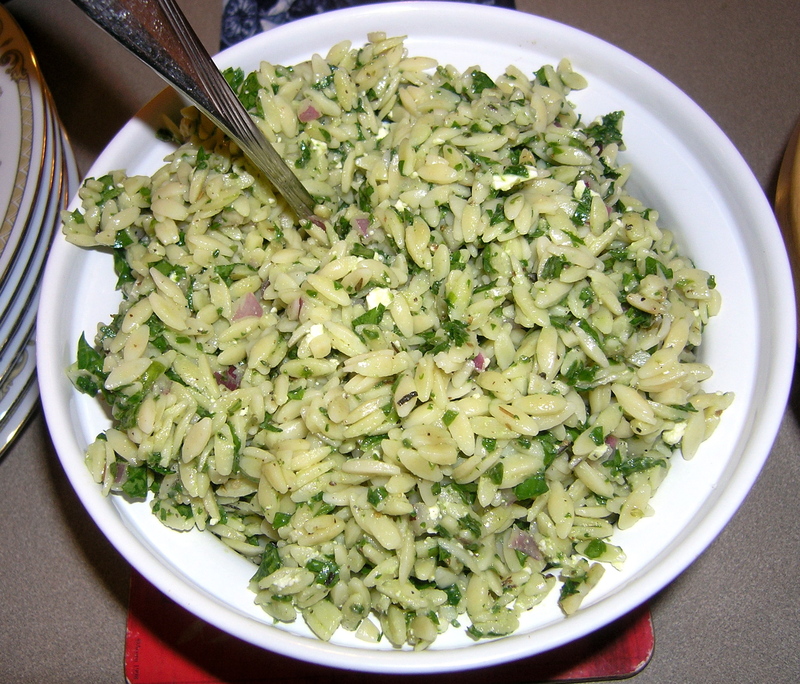 It’s also a sneaky way to add a lot of spinach to a traditional pasta salad, which I am always in favor of! I brought home some extras and added a few other Greek ingredients. You can choose to add the tomatoes and kalamata olives depending on the preferences of your audience. Fill a medium soup pot 3/4 full with water and bring to a boil. Cook the orzo al dente according to package directions. While the pasta is cooking, cut up the vegetables accordingly. When the pasta has finished cooking, pour into a strainer and rinse with cold water until the pasta is at least room temperature if not slightly chilled. Rinse the pot with cold water as well to bring to a chilled temperature. Add the pasta back to the pot and drizzle with the 2-3 tbs olive oil. Just enough to coat it so that it doesn’t stick together. In a small bowl, whisk together the vinegar, garlic powder, oregano, and basil. Add the oil in a steady drizzle to make an emulsion. Add to the pasta. Add the spinach, tomatoes, kalamatas, onion, feta, and parsley to the pasta. Toss very well so that it all mixes together. (If you wanted to make the night before, do not add the tomatoes or kalamatas, but add the rest and stop at this point. Cover and refrigerate overnight). Add a good few cracks of black pepper, but taste before adding salt. The feta and kalamata olives have a lot of sodium, and you will likely need much less than you’d expect. This looks delicious! I’ll have to make this for lunch one day this summer!